DEAD OR ALIVE—Save Our Heritage Organisation is looking for Dia de los Muertos Volunteers. 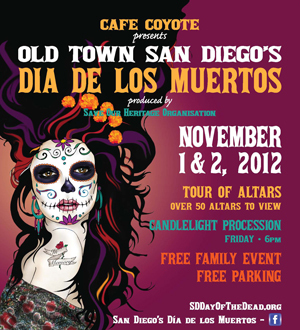 SOHO says it’s well underway in the planning of Old Town San Diego's 3rd Annual Día de los Muertos! This community wide event will take place in Old Town on November 1 & 2. Please check your calendar now to see if you have the time to help us make this event a reality! Without the help of volunteers, this event could not happen. There are a variety of activities happening over the two-day period, so there is sure to be a job to suit everyone! Shifts are only 4 hours long, and there are several to choose from, so you will have plenty of time to enjoy the event before and after your shift. As you can see there is a lot to do and we need more help than ever before as the celebration has grown so much and so quickly! If you would like to volunteer for this event, please fill in the Application form and email Ashley, the Events Volunteer Coordinator, at ashley.christensen@sohosandiego.org or call (619) 297-9327.